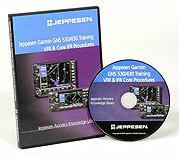 The hands-on, multi-media based practical guide. 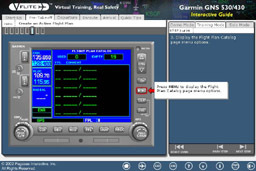 The VFLITE (now Jeppesen) Garmin GNS 530/430 Interactive Guide is an advanced, extensive computer-based learning program that provides information on almost all operational aspects of the GNS 530 and 430 navigators. A realistic built-in emulator is a key part of the program, allowing users to learn procedures in a linear, scenario-based fashion, with extensive animated sequences that match the actual GNS 530/430 screens. The emulator supports a three-step learning methodology. First an animated, narrated sequence demonstrates the selected task. Next, the user practices the operation just demonstrated, the training assisted with textual, on-screen "pop-up" prompts, that guide them through the task. Finally, the user repeats the task alone (without the pop-up help), to reinforce procedures and instill confidence. Re-learn what you forgot, or never really knew you were missing. If you've logged some time with the GNS 530/430, and you're like most pilots, you first probably spent some time reviewing the manual. Then you sat in the cockpit pushing the keys and twisting the knobs to see what they would do (and ran the aircraft battery down). Maybe you used the Garmin simulator (which saved the battery but fell short of real instruction). But when you took off to get some airborne experience with the GNS navigator, you were quickly reminded that flying is where you apply the skills you learned on the ground-not the other way around. If you were really lucky, you may have worked with one of the very few flight instructors who are well versed with the 530 & 430s. Perhaps some time has passed since you last used your GNS and you have become "rusty" on important tasks, such as how to modify a flight plan or select an approach transition. (Hopefully your rust didn't pop up while single pilot on an approach to minimums!). Have you discovered that your GNS management skills are "highly perishable?" Or are you like most GNS owners; you know that the box has powerful functions you aren't using (such as Distance Measurement or the +Map feature) because you haven't had time to learn how to access them. Can you use the OBS mode on your box (it confuses most pilots)? VFLITE can help.